Rob Kearney's fearless skills under the high ball and deft attacking prowess have made him one of the most dangerous fullbacks in world rugby. Kearney made his bow for Leinster in a Celtic League loss to the Ospreys in 2005, having already represented the province at U19 and schoolboy levels. He made his Heineken Cup debut later that season against Bath. 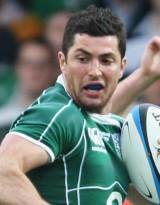 Kearney's development continued with a call-up to the full Ireland squad for the 2007 summer tour to Argentina, and having already played for Ireland A in the Churchill Cup, he made his international debut against the Pumas in June. Kearney made a full impact in the 2008 Six Nations, featuring in all of Ireland's games and scoring against Scotland and England. Kearney then started both of Ireland's tour matches against Australia and New Zealand in the summer of 2008 before also being an ever-present through the 2008 autumn internationals, scoring two tries against Canada. In the 2009 Six Nations, Kearney was an ever-present as Ireland secured a famous Grand Slam. His performances at fullback made him a leading contender for Lions recognition and he followed up on his fine form by helping Leinster to their maiden Heineken Cup title, although he started on the bench at Murrayfield as Leicester were beaten. An early injury on tour meant he only made his first appearance of the 2013 Lions tour five matches into proceedings, coming off the bench against the Waratahs. He subsequently started in the defeat to the Brumbies and the win over the Melbourne Rebels, but Leigh Halfpenny's fine form meant he watched all of the Tests from the sidelines. He was selected for the 2009 Lions tour of South Africa and made the squad for the first Test in Durban. He came on as a first half replacement for the injured Lee Byrne in the first Test and started the other two matches. In the second Test in Pretoria he scored a memorable try but the Lions went on to lose the match and therefore the series. Kearney continued to play a prominent role for Ireland and Leinster but in November 2010 he suffered a serious knee injury against New Zealand, which ruled him out of the remainder of the season. In May of that year he signed a new two-year deal with Leinster and Ireland and he made his return to the international arena in a 10-6 defeat to Scoltand in Ireland's opening World Cup warm-up game in August 2011. The fullback came through the game unscathed, raising his hopes to going to the Rugby World Cup in New Zealand. Kearney made it to the World Cup and played in three of Ireland's games but it wasn't until the following Six Nations campaign that he hit top form with some terrific performances despite Ireland's disappointing showing. His great form continued into the Heineken Cup and he played a crucial role as Leinster were crowned champions of Europe once again. On the international stage Kearney's calm authority and consistent quality ensured he was selected for the British & Irish Lions again, despite Ireland's disappointing Six Nations in 2013.